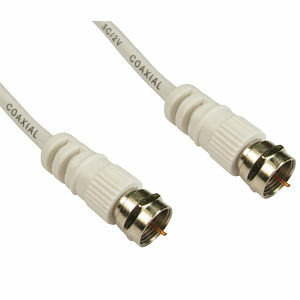 Profiold PGV8905 5m high quality TV Aerial Lead. 24k gold plated aerial connectors for superior signal transfer 99.96% OFC conductors to minimise cable loss. Perfect for aerial connections between home cinema equipment. IAT interference absorbers to reduce EMI interference on your TV picture. Plug to plug lead (male to male), we also stock the Profigold PGV8925 plug to socket lead (male to female). 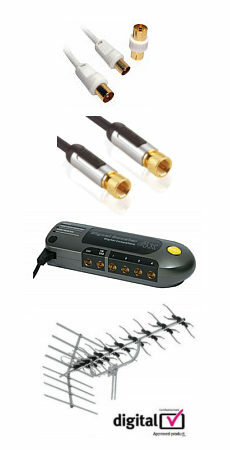 Suitable for Freeview, Freeview HD and analogue aerial connections. SLX 27884K4 Freeview Digital TV Aerial, 48 element wideband digital aerial kit with 4G filter Digital tv aerial kit suitable for weak, medium and strong signal areas. Silver aluminium finish. Suitable for loft or roof mounting. CAI certified. Aerial kit includes tilting aerial clamp, pole mounting bracket, 10m coaxial cable and one coax plug. Now with 4G filtering to prevent interference from 4G mobile signals in the UHF TV band.